Phones made by China's Xiaomi - the world's fourth biggest smartphone maker - are going on sale in the US for the first time, PC Mag UK reports. Carrier US Mobile said it would import a range of Xiaomi handsets from China and sell them from online this week. However, the phones will not include Xiaomi's latest devices such as the high-end Mi Note or run on high-speed 4G networks in the US. 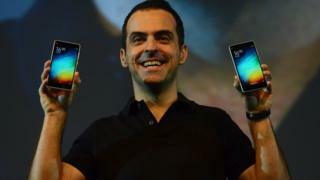 Xiaomi, however, has distanced itself from the move. "There are no plans to sell smartphones through any authorised distributors in the US," a spokeswoman told the BBC. "US Mobile is not authorised to sell Xiaomi products in the US." US Mobile said it would also sell a handset from another giant Chinese manufacturer, Meizu. PC Mag UK reported that the phones that US Mobile would make available online would include the Xiaomi Redmi 2 for $119 (£82.50), the Xiaomi Mi 3 for $135, the Meizu Note 2 for $149, and the Xiaomi Mi 4 for $219. Xiaomi is widely described as China's Apple and is well-known across many parts of Asia for its affordable smartphones, which it sells at a fraction of the cost of an iPhone. Early last year, the Beijing-based giant launched an online store for US customers offering products such as headphones. In April, it launched its Mi 4i phone in India, its top market after mainland China, before introducing its phones to markets in Hong Kong, Singapore and Brazil. Until this week, however, Xiaomi's phones have been virtually impossible to buy in the US. "US consumers have traditionally had to compromise to afford incredible devices," said US Mobile founder and chief executive Ahmed Khattak. "Now, with the launch of our marketplace, we are thrilled to offer complete range of exceptional smartphones for low monthly payments and to give our customers access to exceptional phones otherwise not available in the US"
US Mobile uses the T-Mobile network and prides itself on providing its customers inexpensive contract-free services for all kinds of handsets. The carrier said it would provide service and support for the Chinese-made phones. Video Can Xiaomi take a bite out of Apple?